I have to admit that one of the reasons I wanted to visit London in late November was to enjoy the Christmas scene. I have always loved Christmas (who doesn’t?) so anytime I have an excuse to admire pretty lights and decorated trees, I gladly take part. Luckily, our trip to London provided ample opportunity to celebrate Christmas in November! 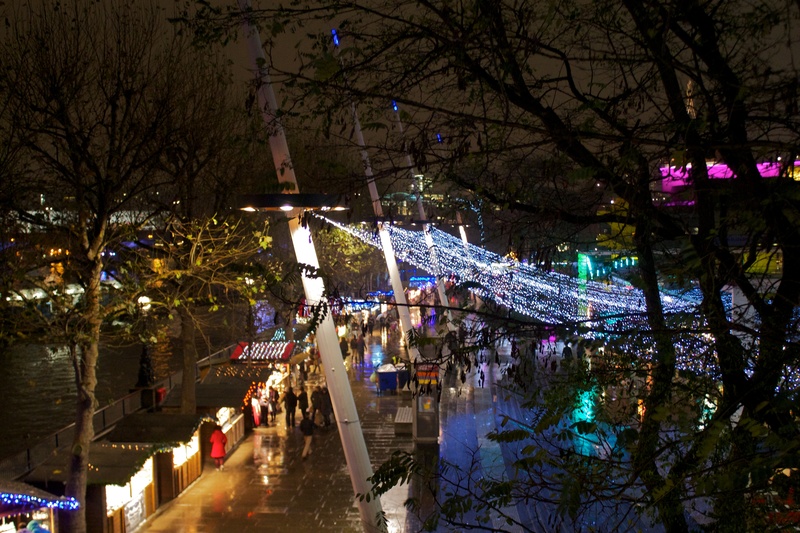 Southbank Christmas Market – just past the London Eye, this relatively small market was frequented by us often. There were stalls lined up on both sides of the walkway and Christmas lights hanging everywhere. While the market opens up in the morning, it’s best to visit at night – browsing the stalls selling knick-knacks under the Christmas lights while sipping on Bailey’s hot chocolate was a highlight of the trip. There are also food stalls if you’re looking for a quick and cheap meal. It opened up in mid-November, so we were able to stop by at the beginning of our trip! 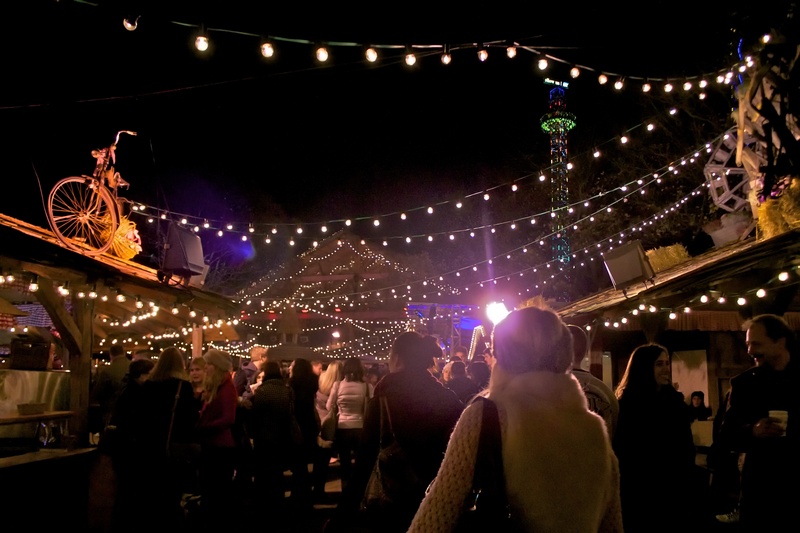 Hyde Park Winter Wonderland – it opened on November 23 this year, which was just two days before we left London. We decided to go on opening night because rain was in the forecast for the next day (and it did rain all day). It was huge compared to the Southbank Market and reminded me of a county fair – rides, games, an ice skating rink, food stalls, and souvenirs. But Winter Wonderland was far superior because of the Christmas lights and holiday stalls. It was packed full of people (and a lot of families with young children). We spent about an hour there, walking past all of the stalls (many sold similar items – ornaments, hats, jewelry, etc.) and listening to live music in the German-themed pavilion (the entrance is pictured below). 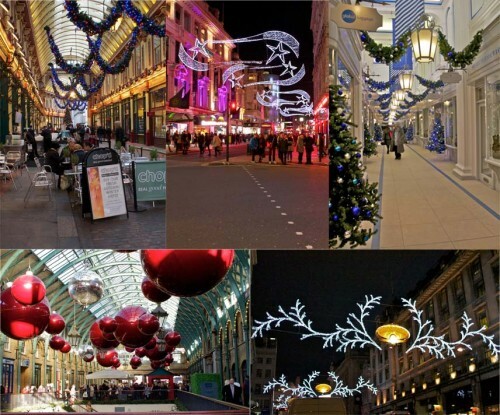 In addition to the putting on Christmas markets, London decorates streets and alleyways with Christmas lights. Some of the bigger areas include Regent Street, Covent Garden, and Oxford Street (lights go up sometime in early-to-mid November and remain lit until early January). The Christmas spirit throughout the city more than makes up for the cold and wet weather in November. I highly recommend a visit to London in late November or early December – especially over the American Thanksgiving, so that you can take advantage of the extra days away from work! It’s such a magical city and I can only imagine that this sense was increased due to the pre-Christmas celebrations. This entry was posted in Holidays, Things To Do, Travel and tagged Christmas, England, London, London 2012 Trip, November, UK by Kristin. Bookmark the permalink.